Using the bathroom is an intimate business, which makes having comfortable fixtures, such as a toilet seat, a big deal. Sadly, most people overlook this necessity, but believe it or not, one of the best investments one can make is to choose a comfortable toilet seat. Fortunately, there is plenty of this bathroom fixture on the market that offers different features, and among the most favorite is the padded toilet seat. 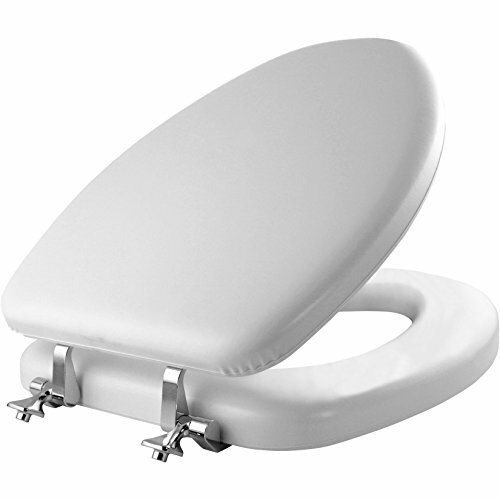 Are you looking for the best padded toilet seat? Here are three good products that shoppers can choose from. Mayfair is a company owned by the Bemis Manufacturing Company, the biggest maker of the toilet seat in the world. Bemis Manufacturing Company was founded in 1901 and currently holds the distinction of being North America’s number one non-automotive producer of plastic molded components. 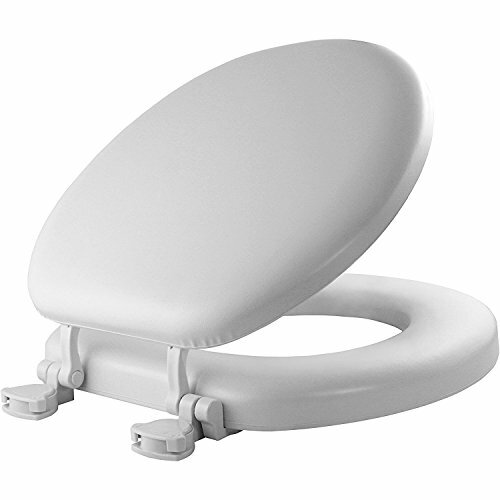 The Mayfair 113CP Elongated Toilet Seat is a durable and comfortable product that’s also eco-friendly. It is made from sustainable materials and processes. It is also soft due to its cushioned vinyl material that is accompanied by a molded wood core. With its classic metal accents or chrome hinges that does not tarnish over time, this toilet seat can help make any bathroom or powder room stylish. It also has an elongated seat at 18.5 inches or 47 cm, but a round shape that measures 16.5 inches or 42 cm of this variant is also available. This 5.84-pound toilet seat can also be used with a variety of brands on the market such as American Standard, Kohler, and TOTO. The seat does not stay up. The hinge does not stay tight for long. Mayfair has been in the business of manufacturing toilet seat for more than 60 years. The company has a wide range of designs that can easily be integrated into any bathroom. The Mayfair 13EC Toilet Seat promises to be a durable and comfortable toilet seat. It features a soft seat due to its cushioned and folded wood care. It is also easy to remove making it convenient for replacement or cleaning. Cleaners only need to twist the product to remove it due to its quick release plastic hinge. This round, white toilet seat is compatible with a wide range of toilet brands such as American Standard, Kohler, and TOTO, to name a few. The manufacturer claims that the materials used for the toilet seat are Eco-friendly. The product measures 16.5 inches or 42 cm and weighs 5.87 pounds, but an elongated version that measures 18.5 inches or 47 cm is also available. Its product maker advises one to measure from the front of the toilet to the center of the mounting holes to ensure a proper fit. They also provide a one-year warranty. Vive Health aims to be a trustworthy online medical equipment store that offers affordable products that users would be proud to use and give their loved ones. The Vive Toilet Seat Riser promises to be the perfect seat riser. It claims to secure and attach to any toilet while providing an additional 3.5 inches of height. It promises to be a great help to those recovering from injury or surgery as well as patients with limited mobility. 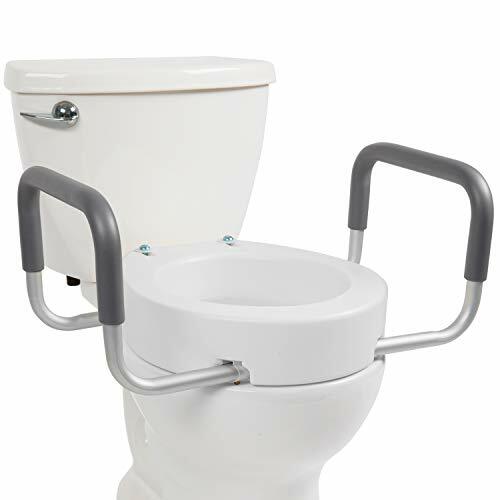 Without the need for any tool, this toilet riser is easy to install and attach with its washers and screws that come with the seat. The bottom of the riser has an interior lip to attach the product securely. It has removable, non-slip handles that are padded which makes them soft to the touch. There are also soft foam hand grips to make the holding of the item comfortable. The width between the two handles is 22 inches. This toilet seat elevator can handle as much as 300 pounds. It is also split-resistant to make it durable. Cleaning the product’s handles is easy, too as one can just use disinfectant wipes. The seat riser is made from aluminum that is corrosion-resistant. The seat riser comes with two 6.125 long screws, two round plastic washer, two round metal washers, two butterfly nuts and a manual for installation. Finding the perfect padded seat is crucial if one wants to make the life of a patient much more convenient. The three products claim to be great goods that deliver on their promises but are they as great as they claim to be? Coming from the same manufacturer, the Mayfair 113CP Elongated Toilet Seat and the Mayfair 13EC Toilet Seat are highly similar in design, which also means that they share the same flaws. Unfortunately, both products’ durability is questionable. There is also much left to be desired when it comes to their design. If you are looking for a temporary but comfortable toilet seat, then any of these two will you a good run for your money. The Vive Toilet Seat Riser is quite different from the two other products. It is also the best padded toilet seat for this review. This is because the product is a well-designed piece that is comfortable and easy to install as well. It is also the most durable among all the products in this review.